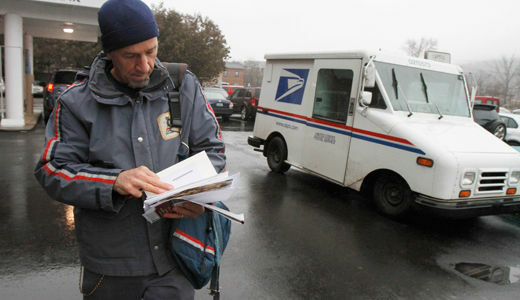 WASHINGTON – Leaders of the nation’s postal unions welcomed the Postal Service board’s April 10 decision to overrule the Postmaster General’s plan to shut down virtually all Saturday pickups and deliveries, retaining six-day service. Donahoe claimed, without offering any proof, that shutting Saturday after Aug. 5, except for package delivery, would save $2 billion yearly. An independent audit, at congressional request, showed a Saturday shutdown would lose $5.2 billion in revenue. The Saturday shutdown was one move Donahoe planned to close what he says is a $16 billion deficit. The Letter Carriers say the biggest part of the deficit is $11.1 billion, so far, in congressionally ordered prepayments of future retirees’ health care costs, covering the next 75 years. Donahoe’s other moves include shutting 114 mail sorting centers so far, plus 75 this year. He wants to fire 100,000 workers and let 100,000 more go by attrition. And the fight on Saturday isn’t over: Rolando said President Obama’s proposed budget for the year starting Oct. 1 wants to shut Saturday service, too. Rolando said Donahoe’s overall plans need drastic revision. 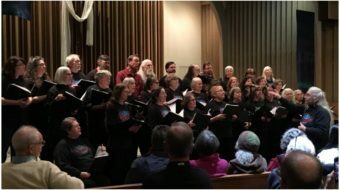 His union staged a successful national day of action on March 24, a Sunday, with events in at least 92 cities – from Maine to Guam – in its campaign to keep Saturday service. “NALC is gratified” the board “has seen the light on the law, but it is time for them to reconsider their entire ‘shrink to survive’ strategy,” Rolando said. Both NALC and the Mail Handlers, a Laborers sector, blasted another idea the board floated: Renegotiating union contracts to cut pay. The contracts were signed in January. “Degrading the Postal Service’s last-mile network is a losing strategy,” Rolando said. “The Postal Service needs a growth strategy. Congress must enact comprehensive reform that overhauls USPS governance, provides greater pricing and product flexibility and reduces or eliminates the crushing (health care) pre-funding burden that caused more than 90 percent of this year’s loss so far.” Shutting on Saturday would start the USPS “on a death spiral,” he added. “The board’s call to reopen and renegotiate the postal labor contracts is yet another sign the Postal Service needs new executive leadership. Asking NALC to renegotiate a contract just settled in January is insulting and unnecessary. The new agreement, which reduced starting pay by 25 percent to 33 percent and allows for major health care savings, provides for several labor-management task forces to work on ways to increase revenues and cut costs,” Rolando pointed out. He also said the March 24 grass-roots lobbying by his union’s members, joined by the Mail Handlers – a Laborers sector – and other postal unions was “critical” to the board’s reversal. “We will continue to rely on our members as the fight to protect and preserve the U.S. 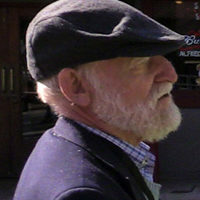 Postal Service continues,” Rolando vowed. The Mail Handlers also welcomed the postal board’s decision to save Saturday – and noted it “essentially was forced upon the board” by Congress. The Mail Handlers said they would support any USPS moves to increase revenue, including rate hikes “across all products not covering their costs.” NALC and the Mail Handlers have made the point for years that first-class mail, which is profitable even in a recession, is subsidizing bulk mail. But the postal board and management has catered to the bulk mailers, letting them ship their mailings at below cost. “To the extent, however, that the board is directing management to ‘reopen negotiations with the postal unions to lower total workforce costs,’ the pursuit of such an alternative is unlikely to be successful,” the Mail Handlers warned. 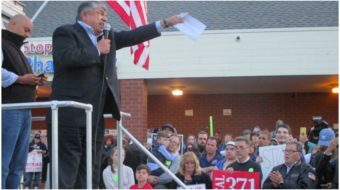 Rep. Gerry Connolly, D-Va., who got a legal ruling from the independent Government Accountability Office saying Congress ordered six-day service to continue, both last year and this year, lauded the board for following the law.